As a new year starts, I reflect on the twists, turns and sprinklings of grace that have been my past year. I moved back from Philadelphia at the end of July and started working in Durham in August. The further removed I am from my year of service, the more I come to appreciate the role it played in my life. It gave me a year to grow in community with amazing women and to see how respect, simplicity and kindness of heart can foster a true sense of joy and belonging. I also grew in my ability to trust in God’s plan for me. I remember the anxiety I experienced as I applied for jobs at the end of my year as an RMC. When I got the interview offer in Durham, I was very much torn between this opportunity and those that may have lied in Charlotte, my home city. I felt at peace and I walked back to the house my family was staying at on vacation. I decided to place my worries in God’s hands for now and enjoy the rest of my vacation. The next Monday, I went to an interview in Durham and accepted a job on Wednesday. It really wasn’t what I had expected to be the next chapter of my life. I thought I would be in Charlotte right now. Looking back after five months spent working and living in Durham, I realize how much God knows what he’s doing. I have learned so much as a nurse and I am working in an environment that is supportive and full of new opportunities. There are also small ways that I have seen God’s grace since being here. When I was in Nursing school, I switched a clinical assignment so that I could work within a prison setting. The clinical ended up not working out, and I found myself doing my final clinical at the hospital at which I now work. At the time, I was upset. I really thought that I was supposed to be working at a prison, and this change in plans made me doubt that God really has any plan at all – dramatic as that may sound. Now, I laugh at this because I would not be working where I am today had I not switched my clinical! I am also about to begin volunteering within the medical center at the prison that I originally would have completed my clinical. To top it off, in my interview for the volunteer position at the prison I learned that the woman interviewing me used to work where I volunteered as an RMC! I just see God sitting in heaven, smiling at how He plans things out. Despite an unusually bustling weekend in Sea Isle City, NJ, January 8-10 was a peaceful weekend, both spiritually and physically, during our “Lavender Springs” mid-year retreat weekend. During the retreat, we were invited to focus on deepening our relationship with God through a focus on the Psalms. Ashley and I were blessed to be joined by an RMC alum, Kelly, for the retreat weekend. This made for especially rich discussion and sharing, as each one of us is at a different stage in our lives, with unique perspectives on the Psalms and how they apply to our lives. Thank you, God, for beautiful weather, good companions and signs of your presence all around us! The following reflection was written by current RMC, Ashley Pickert. “After being in Philly for a couple of months, people would ask me: so is it what you expected? Not at all. Coming into the program, I was looking forward to all the medical experience I was going to gain. I would learn how to use medical equipment and become accustom to the hospital jargon and terminology. It would assist me in being ahead of my fellow medical students later on. I never thought those things would become the least important part of my experience. In four short months my eyes have been opened to the most vital part of being a good doctor: the patient himself/herself. It began by volunteering with the Healing Consciousness Foundation under Dr. Beth DuPree. She and her foundation work with patients by focusing on the whole person rather than just the problem itself. It became very apparent to me early on that a doctor may shrink a tumor through radiation and chemotherapy or remove the cancer entirely through a mastectomy, but without looking at why the problem occurred in the first place, the chances of recurrence increased exponentially. The foundation provides not only medical care but reiki, acupuncture, personal fitness counseling, nutrition counseling etc. In this way, the mental as well as the physical plights can be taken care of and the patient can move forward in a much better light than when they arrived.More specifically, I have learned that I can get a blanket or a glass of water for a patient, but my presence itself is much more valuable. Although many people have great support throughout their cancer journey, some are forced to go it alone. Receiving a cancer diagnosis can be devastating enough with family or friends surrounding a person, let alone by themselves. Going through treatments day after day and being sick constantly, can wear someone down and they can fall into a depression. Probably my favorite part in my ministry is being present for people in whatever way I can. If I am able to have a conversation with someone, hold their hand while they are getting biopsied, smile as I walk by, or even just to sit with someone as they receive treatment especially with those who are alone, I feel like I have had an accomplished day. For the most part that is truly what a patient needs: someone to care. This month’s RMC day was all about getting in the Christmas spirit! We took a step back from the everyday busyness to enjoy each other’s company, engage in prayerful conversation and take in the beauty of Philadelphia at Christmastime with childlike wonder! During the RMC day we were able to visit a number of iconic Christmas attractions in the city: the Macy’s Holiday Light Show, which has been around for over 50 years; Dickens’ Village, a walk-through experience of the beloved tale A Christmas Carol; Reading Terminal Market with its Holiday Railroad display; and the Christmas Village at Love Park, modeled after the traditional Christmas markets in Germany. As we took in the sights with childlike wonder, I was reminded of what Jesus said in Matthew 18:3: “Truly, I say to you, unless you turn and become like children, you will never enter the kingdom of heaven.” What a gift to see things with the excitement of a child! What a gift this Advent season to wait for the arrival of Christ with childlike anticipation! Thank you, God, for this day of joy, excitement and hope. Thank you for reminding us that it is good to be children sometimes! It certainly is a comforting thing to have! What a blessing from God to have friends with whom we can share our journeys. Friends are motivating, caring, supportive, thoughtful. They are a reflection of God’s love for us! Several former RMC’s who live in the area or have come to visit in the past few months have become friends with our current RMC, Ashley. How comforting to have friends with whom you can share similar experiences! My coworkers, who I am lucky to call my friends, made the transition from maternity leave back to work a little easier by decorating my office and welcoming me with hugs and warm wishes. As RMC Ashley becomes more settled in her ministries, she develops friendships and meaningful relationships with coworkers and patients alike. The Redeemer Ministry Corps family is very fortunate to have such wonderful friends! Oktoberfest is back! Join the Sisters of the Holy Redeemer in celebrating their German Heritage with a fun-filled weekend of German music, food and drinks! There will also be children’s activities, pony and hayrides, Vendor’s tables, raffle baskets and games of chance. This event occurs rain or shine and provides fun for young and old alike. Parking is free with the opportunity for a free-will offering. We hope to see you there! 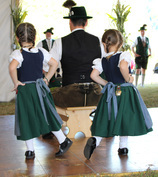 For more information on the event and our sponsors, please visit the Sisters’ Oktoberfest page. Next month, hundreds of thousands of people (or more) will gather in Philadelphia for the World Meeting of Families and the visit of Pope Francis. Each week at Sunday Liturgy, we join Catholics around the world in reciting the prayer for the World Meeting of Families. During this exciting time focusing on the family, I am reminded of the beauty of the Redeemer Ministry Corps family. Though not related by blood, our family of RMC volunteers past and present, Sisters, alternative break students and friends of the program are joined by a common mission. Last week, we were privileged to add another member to the RMC family. Ashley arrived in Philadelphia on August 16th to begin her orientation to the program. On Sunday, August 23rd, we celebrated Ashley’s official start of the program with a Missioning Mass. Ashley shared the mission statement she created for herself for the year, and the Congregation blessed her on the start of her journey. This week Ashley begins serving in her ministries at the Southampton Women’s Health Center and the Bott Cancer Center. She will certainly not be without support, as I know our RMC family will be keeping her in prayer and thought. May God bless you and your families, as you have so richly blessed ours!